The following steps will guide the user in creating custom data. First, prepare your data in a simple tab-delimited text file. Be sure that the first column is student ID numbers and that the first row includes column names (no spaces or special characters). 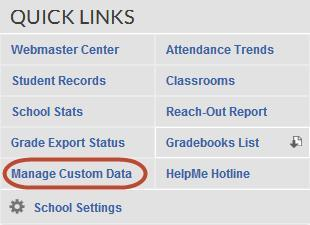 Click Manage Custom Data in the Toolbox section. Click New Custom Data on the following page. Click Choose File to locate the file from your hard drive. Enter a Title. The title is merely a label for use during setup. Enter texts in the three Template fields (Header, Row, and Footer). These templates allow you to customize the look and feel of how your data is displayed. Refer to template examples for more detailed information. 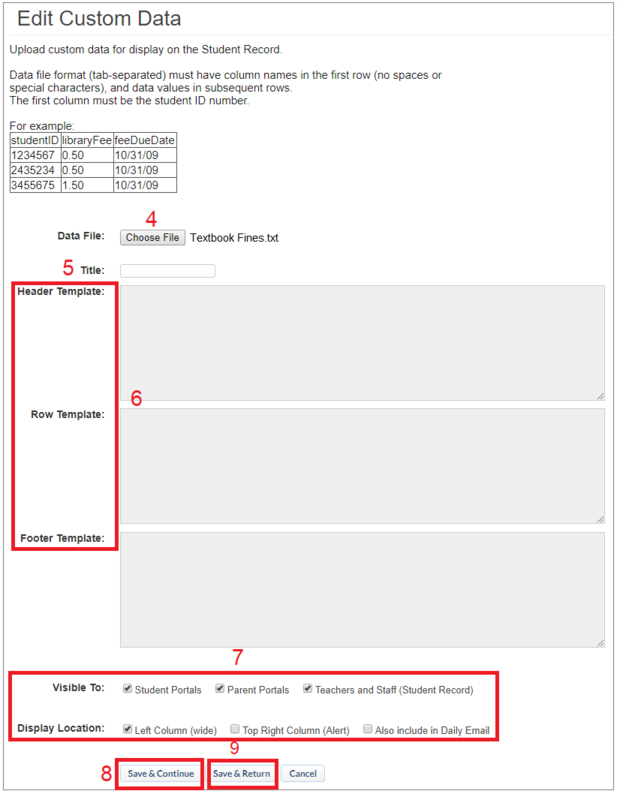 Tick the checkboxes at the bottom of the form to choose who may view the data and where it will be displayed. Click Save & Continue. A preview of your data is displayed at the bottom of the page. If you're not happy with the display, alter your template and click the Save & Continue button again. Once satisfied with the results, click Save & Return. The created Custom Data can be seen in the Manage Custom Data section. You can click Publish to display the data for your intended audience.